Roof racks can be invaluable tools to carrying more things with you on a road trip. They can be secure and vital, but it is important to use them right in order to avoid damaging your equipment or your vehicle. Though it may seem obvious, one of the most important things for you to do with your roof rack is pay attention to the use instructions. Make sure that you read them carefully before proceeding. Always pay attention to the specific torque settings and try to avoid overloading the rack if you feel as though you have more things that you want to take with you. 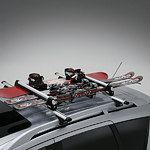 Want to shop for a new roof rack installation today? Be sure to visit Cassill Motors Inc and see what our capable professionals can do for your vehicle!